"Great company to do business with"
"I love my Mattracks and the compliments I get while driving around, on or off road. Thanks!" "Have owned three sets, they all worked great"
"I was very impressed with your employees. Their knowledge of your product and willingness to share it is incredible. From my first contact with the parts departement through the time when I picked up the tracks and followed up with a question during installation, your people were very informative and friendly. I am glad I chose Mattracks." "It's exciting," CFA Operations Officer Paul Horton said. "We had eight inches of snow on the ground and the truck left a track just one inch deep." Mr. Horton said the truck was highly maneuverable and light-weight, which gave CFA's fleet added flexibility. "We now have access to areas we've never had before and in a more timely fashion. This gives us great confidence in the concept and hope for potentially expanding its use more widely in the future." CFA is a volunteer and community based fire and emergency services organization. They help protect 3.3 million Victorians, and more than one million homes and properties across the state. "The tracks are great! They work well on all terrain I use them, especially snow. 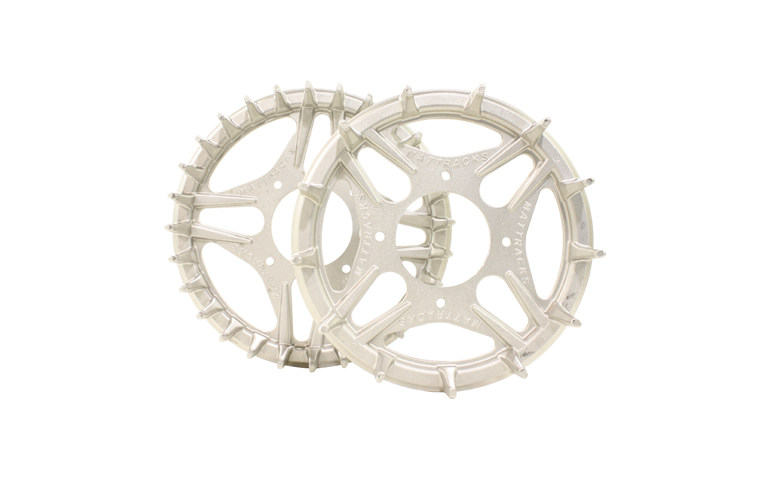 They work well with my sno-blade on and have lots of power for pushing snow." "Bad weather, rough terrain or a combination of both can often impede maintenance or repair on a transmission line. We're always running into situations where we've got challenging terrain to deal with. This kind of system can only make us more effective in keeping the lights on." "We're pleased with the set of Mattracks we've been using. We use that vehicle to patrol our lines and transport work crews and their gear, so it has to be dependable. The tracks work well in our winter snow conditions because they provide good flotation and ground clearance." "We've put more than 2,000 miles on our set of tracks. In the winter we use that rig for transporting people and light loads across the tundra in support of our natural gas pipeline. Using a pickup with Mattracks is certainly a lot more convenient and comfortable than using a conventional track rig." "For the most part, it was right out across the tundra, rivers and all. We had a set of Mattracks on each of the two new Chevy ¾ ton 4x4s. The tracks worked great. In fact, we wound up dragging some of the wheeled vehicles part of the way with the two Mattrack rigs. Another nice thing is that riding in a truck with Mattracks doesn't beat you to death the way some track rigs will." "This has been the hottest thing at the show this year. If your truck'll take it, it'll take you there. Mattracks has an application for just about any vehicle." "Our main obstacle, obscured by tall grass, was a ditch filled with mud and water. Our vehicle with Mattracks cleared it easily. With ordinary tires, the truck certainly would have gotten stuck." "The economics of the situation were simple: I had 1,500 acres of canola standing in water. Canola has to be cut at a certain time and you can't wait because the ground might never dry up. With that many acres at risk, we really had no other choice but to put on Mattracks. You could feel the swather working easily in the mud. These tracks only left an imprint only three or four inches deep in the worst mud and we had none of the rutting you see with rice tires or steel tracks. The field is left smooth for the combine and there's a dollar value on that." "Rubber tracks are the answer to a problem that has plagued me for years. They're light, maneuverable and there is no doubt these tracks work. If you have crop out there in the mud and you have no machine to cut it, you have to say this makes good economic sense." "On our farm the solution to the mud problem was limited to what we could cut because of the clearance and the mud being thrown up. It would always squish mud onto the swath. This is much better. We literally float on the surface of the mud and our swath stays clean." "It's perfectly smooth in the mud, where the tracks are designed to be used. They seem to take almost no power from your engine because you're floating over the mud instead of digging down into it." "The rubber tracks just rolled over the plants and they sprang back up again and there was no plant loss." "This will improve response capability for fires or medical emergencies. It handles steep hills very well, going up or down. This is a valuable addition to the department which will extend the usability for on and off-road use in winter." "Transports people up the Mount Washington Auto Road ten months a year in a 12-passenger snow coach with tracks. When climbing, the wind grows stronger, snow swirls creating great drifts. This is no place for the timid, it is the home of the most severe and unpredictable weather in North America, climbing to 4,000 feet above sea level, which is as far as the snow coach can go, but got to this point with Mattracks." "Working in vehicle maintenance in Antarctica, where the air is so clean and pure, with no pollution, there is a downside, naturally, the weather. While temperatures will reach 30 degrees in the summer, which comes in December and January, much of the time it's dangerous to be outside because of the cold or white-out conditions. Our experiment stations are as far as 50 miles away and it's important for vehicles to be reliable and able to handle tough terrain. The reliability is the three sets of Mattracks we have on vehicles when there is tough sledding. They're valuable to us because they provide a footprint and traction. We don't need to build a road and we can go off the beaten track where tired vehicles can't go." "The tracks shine where the others falter. Very deep fresh snow for example. I had one day where I was driving through a high alpine meadow on a lee slope so I knew it was wind-loaded deep fresh snow, but I wasn't 100% sure how deep the snow was or what was under the windblow stuff. The Mattracks were only sinking about 8 inches into the surface, but the trees all looked smaller than I remembered from the summer. When I hopped out of the truck and onto the snow I sunk all the way up to my chest. When I dug a pit it turns out it was about 4 feet of fluffy stuff on top of a loose base that was another 4 feet thick. There's no way I would get through that on any of my tires. In fact, there would be no way for me to even winch more than a couple of feet through that. But with the tracks on we just floated on top." "Been extremely happy with the Mattracks... Provided me now going on 7 years of unstoppable and reliable ice-fishing transportation." "These work great. We had some on our Polaris XP1000 and did some back country snowboarding. Had a ton of fun." "I have them on my Kubota RTV900 and with tires it would pull pretty good, but at times when pulling trees from the woods it would just spin out. I put the tracks on and never slowed down again. Plus the added footprint for traction, but you could really see a difference in the pulling power (torque)." 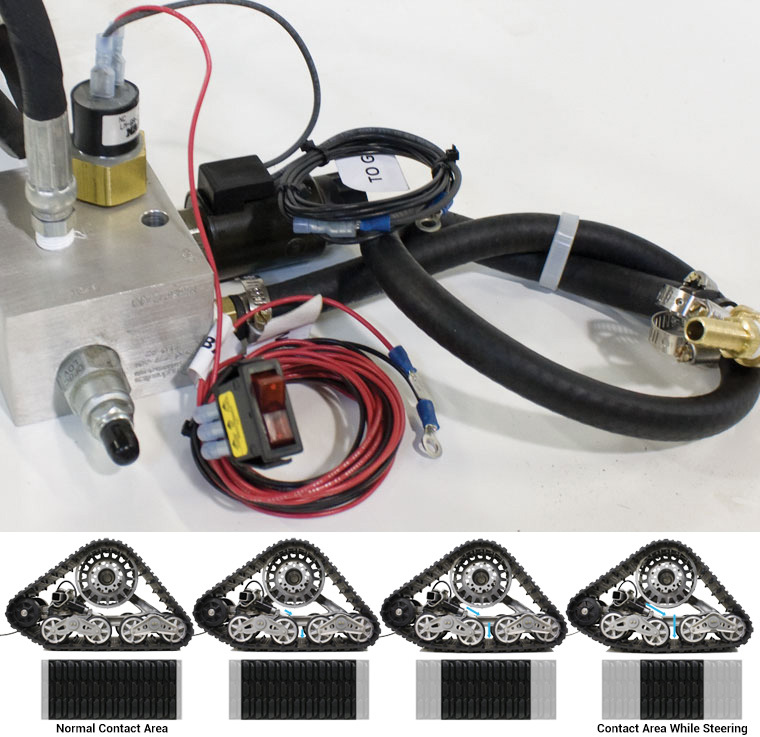 "Mattracks are a very cool accessory to have on any 4 wheeled vehicle. They are for almost any ATV/UTV and can turn anything with them on into an unstoppable machine! They even received a vehicle safety award in late 1997." "If you need to get through snow, mud, sand or any other soft material they cannot be beat." "The vehicle feels 2-3 times more capable and more stable with tracks on. Overall, the Mattracks are impressive." "For the James Bond Spectre movie we did in Austria: the Mattracks system worked awesome with our purpose built Edge Toyota Tundra."